The seventh season of “Kodoku no Gurume” has finally started here in Nagasaki. Even though this drama is my favorite, I missed, unfortunately, the first episode of it because I didn’t check about when it would start. I don’t know how many times I watched this drama repeatedely, from the first season to six, on Amazon prime video. I also don’t know why I love this drama in which a middle aged guy just eats what he wants to without any particular event or any dramatic occasion. I went to Yokohama at the end of last year to visit my best friend. There was one thing in my mind I wanted to do at that time, and it was to eat any dish Goro who is the main character of the drama ate in it. I told about my wishes to my friend and he gave some information about it. I then finally decided about the dish I was going to give a try. The dish was “Tantanmen without soup” served at a Chinese restaurant called “Yan” in Ikebukuro. I saw the dish in the first season of the drama, and I remember Goro ate it sweating profusely but happily. I was really thrilled when I ordered it. At the first mouthful, I felt it’s OK, but then I was shocked by the spiciness of it. I managed to finish it but my tongue almost went numb. However, I was satisfied and felt happy because I could achieve a goal that I had aimed for, I’m wondering now about what dish I’m going to have next time. I know one reason why I love this drama. The reason is that the music in this drama is really fantastic. 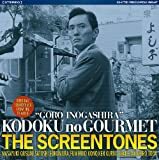 I couldn’t help buying the sound track CD of this drama, the band that plays all the tunes in it is THE SCREENTONES which the author Kusumi Masayuki belongs to. I was amazed by the fact that none of their tunes is copyrighted.